The Tempe Center for the Arts ("TCA") opened in September 2007. It has two stages, meeting rooms, an indoor gallery and outdoor gallery, an outdoor park area and a reflecting pool, all on a 25-acre site. The TCA is located just south Tempe Town Lake, and adjacent to Tempe Beach Park. This multi-use facility combines stunning modern architecture with acoustical excellence. See the map of this location and get directions on the next page. 1. Tempe Center for the Arts Box Office, at 700 W. Rio Salado Parkway at the main entrance. It is open every day (limited hours on weekends). On performance days the box office opens two hours prior to curtain or at noon, whichever is earliest, and closes after intermission of the last show or at 5 p.m., whichever is latest. 2. Tempe Center for the Arts online. 3. By phone to the Tempe Center for the Arts Box Office at 480-350-2822. See a seating chart for the Tempe Center for the Arts. Official Website: Tempe Center for the Arts online. No seat in any of the theaters or auditoriums is more than 55 feet from the stage. Theater seats 600 people on three levels, and features soft, permanently affixed chairs. Dance, drama, small scale opera, musical theater, orchestral performances and solo recitals are held here. Studio has 200 with non-cushioned seats that can be moved around into different configurations, depending on the performance. Smaller musical and stage performances are held here. Gallery usually features artwork from local, regional and national artists. This space may also be used for poetry readings or lectures. Lakeside is an auditorium that is available for weddings, banquets, meetings, receptions. It may also be used for lectures. Check the calendar for shows and performances taking place at TCA. From September through November and January through May Tempe Center for the Arts hosts Walk-In Wednesdays where local musicians can perform in an open mic environment and the audience can enjoy the music for free. The Tempe Center for the Arts is on the south side of Tempe Town lake and adjacent to Tempe Beach Park in downtown Tempe. The major cross streets are Rio Salado Parkway and Hardy Drive. Hardy Drive is west of Mill Avenue. From wherever in the Phoenix area you are traveling, get to the 202 Red Mountain Freeway (NOT the 202 San Tan Freeway). If you are approaching Tempe from the west and driving east, exit at Priest Drive. Turn right (south) on Priest, and then left (east) on Rio Salado Parkway to Hardy Drive. Turn left at Hardy (north) to enter the parking lot. If you are approaching Tempe on the 202 from the east and driving west, exit at Rural Road. On Rural Road make a left (south) to Rio Salado Parkway. Make a right (east) on Rio Salado parkway, driving across Mill Avenue, to Hardy. Make a right turn (north) to enter the parking lot. The entrance to the main parking lot is on the north side of the building, on Hardy Drive just north of the Rio Salado Parkway. Tempe Center for the Arts is not accessible by Valley Metro Rail; the nearest station is Third Street/Mill Avenue in Tempe, about a mile away. If you are visiting from out of town, or just live far enough away to warrant a stay in a hotel, these recommended hotels in Tempe are close by, but still about a mile away. If you don't have a car, call and see which ones might have a shuttle to the theatre, and make sure they run late enough to pick you up when the show is over. 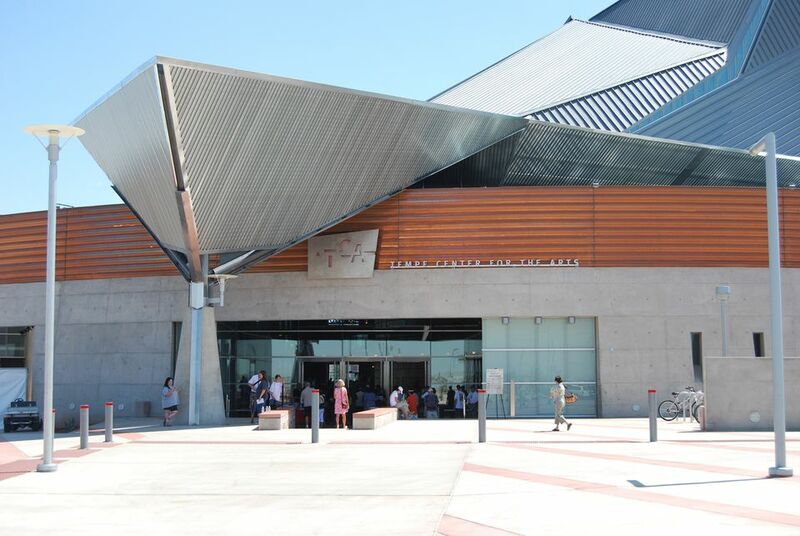 The Tempe Center for the Arts in downtown Tempe, AZ offers music, dance and theatrical performances. There are two stages at the Tempe Center for the Arts. Theater is the larger auditorium (600 seats), and Studio is the smaller auditorium (200 seats). No seat in either theater is more than 55 feet from the stage.